We have all had our favorite necklace pulled on by a baby's messy hand or have had a Carrie Bradshaw moment and lost it in a bottomless clutch. No matter what your jewelry goes through it is important to have a cleaning routine that keeps all of your favorite pieces including your AnnaBee jewelry in tip top shape. Ideally each piece of your jewelry would be stored in individual airtight baggies. This is the best way to keep it clean and to prevent tarnishing. However, we totally get that its not always that practical. As a jewelry designer, over the years I have looked for cleaners that are easy enough to do at home, yet look like I have had them professionally cleaned. Alas, after many attempts of trying a number of solutions I have found my top 4 that I recommend to all of my friends, family, and clients. The first one I use is for all of my sterling silver jewelry. The "Connoisseurs Jewelry Cleaner" for sterling silver is perfect for all of your rings, bracelets, and your Anna Bee necklaces chains. This cleaner is simple to use as you just place the item on the tray and soak for no more than 10 seconds. I just hold the tags and dip the chain it. It is important to do it this way because if you put the whole necklace in there, it will remover the dye that make the letters and numbers darker. It is very important that when doing this you never soak longer that 10 seconds as it is crazy powerful and can ruin your jewelry if left in for too long (I may or may not have done this before...eek). The second cleaner I love to use is strictly for gold jewelry. The "Hagerty Jewel Clean" is perfect for polishing all of my gold jewelry and removes all fingerprints and scuffs. Again, this is a simple one to use and though it says it is perfect for all types of metal and stones, I stricly use this for my gold pieces. Lastly, I use our signature Anna Bee cleaning cloth to clean all of the personalized tags on our necklaces. Not only does it have the cute Anna Bee logo but it is a two part cleaner as the inner layer is a treated cloth that removes dirt, light tarnish and grubby little finger prints away and the outer layer polishes it up to perfection. It is perfect for giving your jewelry a last minute shine before you head out...plus it has our cute little bee on there! I'd love to hear of any other great cleaning tips, or other ways you preserve your jewelry! Do you have a date that you will always remember or at least try to? Between wedding anniversaries, children's birthdays, or your favorite lucky number, these dates stick with us for our entire lives and we do our best to remember and cherish them. In nursery's there is a new trend of wall art that displays numbers such as the date, weight, and time your little one made their debut. With wedding dates, we see these numbers printed on everything from tote bags to pillows. The biggest trend we have seen though is wearing these sentimental numbers in your everyday wardrobe with customized accessories. From bloggers to celebrities this one of a kind jewelry is the new way to tie a memory with your mumu. There is something to be said about simple and clean designs. We have seen this trend of contemporary, clean silhouette's throughout our closets and our homes. It could be the long days at the office or our never-ending to do list at home that make us appreciate classy, uncomplicated designs. Whatever the reason may be, we love it. 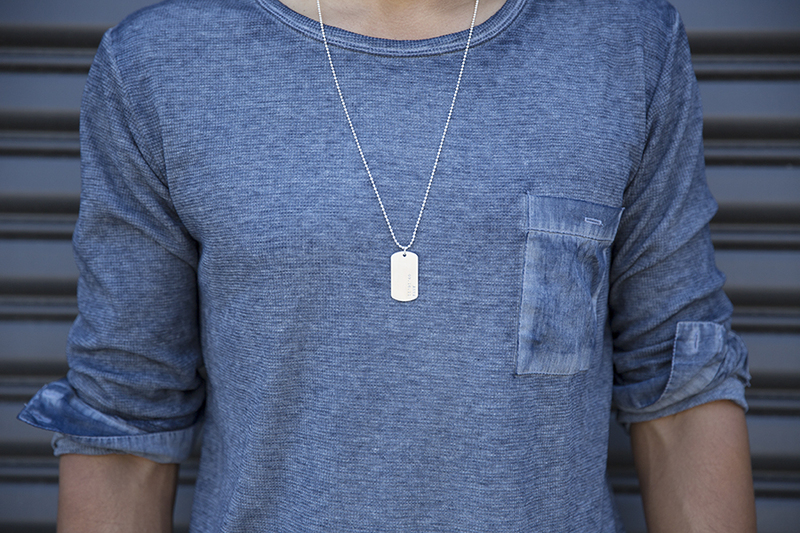 From understated elegant necklaces to comfortable tee shirts, we know this is one “classic” look for years to come. Thank you for visiting our Anna Bee blog. We hope you enjoy our jewelry as much as we do and find it to be one of the staples in your everyday wardrobe. Here at Anna Bee we are always looking for new, creative looks whether it be in jewelry, fashion, or home. You can find our newest looks and collections here, as well as some of our favorite everyday products.